DRIVERS in Donegal have been warned not to get behind the wheel while under the influence this Christmas as the annual cross border campaign got underway. 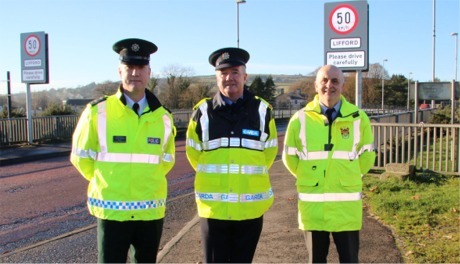 The Garda Siochana and PSNI launch was co-ordinated by Garda Inspector Michael Harrison and PSNI Inspector John Miller at the Lifford/Strabane border yesterday. The campaign reinforces the continued co-operation between both forces with regard to road safety on both sides of the border. Inspector John Miller, PSNI, Inspector Michael Harrison, An Garda Siochana and Donegal Road Safety Officer, Brian O’Donnell launch this year’s cross border Christmas Drink Driving campaign on the N14 at Lifford/Strabane. Drivers can expect "a significant increase" on the mandatory alcohol testing checkpoints that are already conducted each month in Donegal. Inspector Harrison said: "Drivers continue to selfishly ignore all the advice that has been offered in relation to drink driving. While the high profile series of Gardaí and PSNI operations will continue to target drink drivers day and night throughout the coming weeks, the sad reality is that more people will be caught drink driving during this campaign. We are appealing for everyone to support our campaign and stay safe on the roads."